BitFenix introduced the full-tower Shinobi XL case, this model will start shipping in February for 139.90EUR. The case specialist BitFenix is not simply growing the Shinobi Midi-Tower, but is also adding a long list of functionality to the Shinobi XL variant. 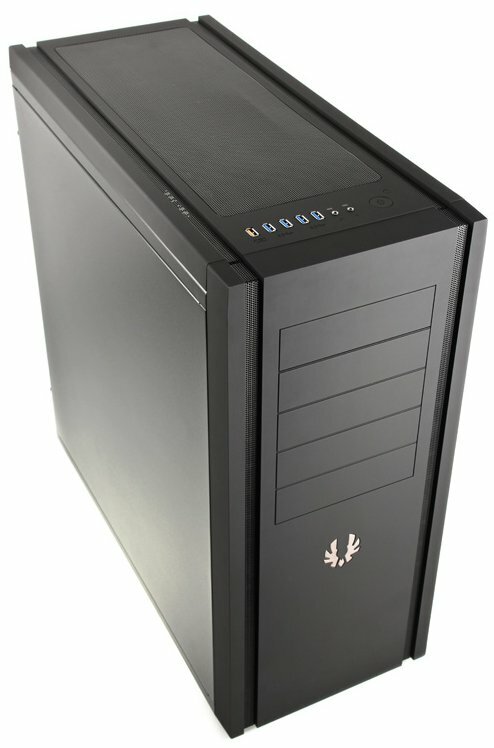 USB 3.0, FlexCage, SuperCharge port to charge smart phones or tablets, the capability to hold two 360 and one 240 mm radiators, nine expansion slots, enough space for XL-ATX boards and a plethora of pre-installed fans make the case an evolution of its smaller brethren. One of the secrets to the success of the BitFenix Shinobi is the clean, timeless exterior look. The straight and understated design from the front to the rear, closed and flat surfaces in addition to the well placed mesh stripes make it the perfect looking Midi-Tower. The SofTouch surface revolutionized the industry, clearly steering away from the glossy aspects found on many other enclosures. For all those who considered the original Shinobi to be too small, BitFenix is now offering the perfect addition with the Shinobi XL - a full tower chassis which manages to deliver the same timeless look and feel, including the mesh strips on the sides. Below the large top metal mesh one may fit up to three 120 mm or two 230 mm cooling units, one of which BitFenix includes in form of their retail Spectre fan. Another such 230 mm unit has been placed in the front, with enough space to be exchanged with up to three 120 mm variants. Two additional 120 mm ones may be installed in the floor of the chassis, while one pre-installed 140 mm fan pushes hot air out the back of the chassis. An excellent air flow is already given right out of the box, with the possibility to push the envelope even further if need be. With water cooling being the pinnacle of modern day heat dissipation, the BitFenix Shinobi XL is able to hold an incredible setup without breaking a sweat. Next to the four openings in the rear to route water cooling tubes out the back, the Shinobi XL may hold a 360 mm radiator in the ceiling and a 240 mm unit in the floor of the chassis. On top of that, an additional 360 mm variant may be installed in the front of the case, while still leaving two bays free for the mandatory optical drive and one storage unit. The BitFenix Shinobi XL measures 24.5 x 57 x 55.7 cm, which clearly makes it a full tower chassis. This makes the bigger brethren of the original Shinobi the perfect fit for an ultimate gaming system or high-end workstation as it can easily hold every component you may throw at it. In addition to the five optical drive bays, up to eight hard drives may be placed with the chassis. One of the external bays may also be used for a 3.5 inch device like a card reader, if need be - thanks to the included adapter. The hard drive cage is not an ordinary unit either. With the name of FlexCage, one may install the drives turned by 90° or remove the cage completely. Once out of the chassis, the Shinobi XL offers an incredible 492 mm of space - more than you will ever need for the biggest and fastest graphic cards in the market. Even with the FlexCage in place, 377 mm of space still remain. Thanks to the plethora of expansion slots, the Shinobi XL can easily hold an XL-ATX mainboard. The large opening in the mainboard tray along with the many cut-outs around the board area make the upkeep and clean cable management a breeze within the chassis. This goes especially well with the 34.5 mm of space between the mainboard tray and side panel - plenty of space to route all cables nicely to their destination. 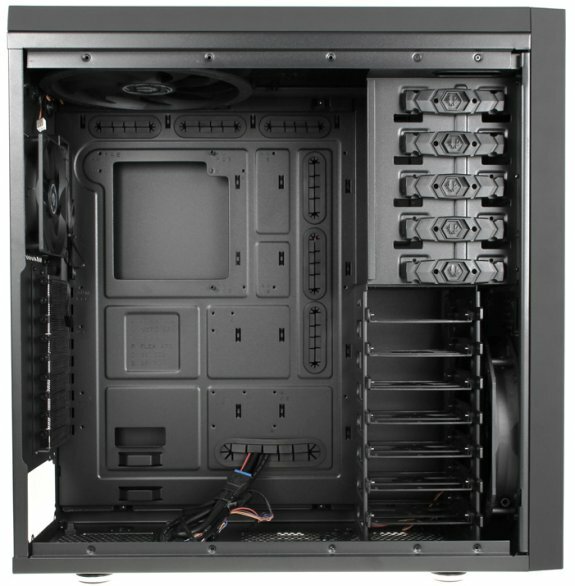 With a clearance of 210 mm, even the tallest CPU coolers will easily fit within the chassis. While the chassis manages to impress on the inside, the exterior manages to deliver with a list of unique features as well. Besides the pair of audio connectivity, the Shinobi XL offers four internally connectable USB 3.0 ports and the unique, yellow SuperCharge port. This plug delivers up to 2.5 Amps of power, allowing you to charge any of the power hungry gadgets like cell phones or tablets with ease. This port is connected directly to a SATA power cable of the ATX power supply.